Leaving Belfast Airport I noticed in the taste of Ulster shop they were selling key rings of Northern Ireland - made in China. When you actually get here you wonder why we even bother to try and thing about manufacturing anything any more . Oh actually we don't. China in the city's is as developed as western countries, in fact more so as they have leaped frogged a lot of technology . So we travelled on the magnetic train for instance into the city centre. The first hotel we stayed at was top class and only 25 per night - try and get a B and B for that in Portrush? The overwhelming feeling is there are so many people, China is the same size as the US but has three times as many people and there is a feeling that they are all working incredibly hard day and night. People are pleasant and after the initially shock of knowing none of the language we are all getting around. They are very excited about hosting the Olympics and there is lots of TV about all of the people coming out in different countries to support the Olympic flames journey to Bejing.Mmmmmmmmmmm. Many things are fascinating, we are currently in HangZhou lots of lakes and islands around the city and we were woken up this morning at 8.30 by the children in school out in the playground doing exercises to Queen, we will rock you. I wonder if it would catch on in Belfast? The way the administration works you cannot move from province to province to work without the necessary papers. So if you do you cannot register for health care or school etc. This leaves you vulnerable particularly if you have to move to be able to eat. So do I have that foriegner feeling? yes,, it feels even stronger as I am alot taller than a lot of the women. There are many tall men but not women. This has caused some interest and we have been the subject of alot of photos by school girls but it's all in good spirits. Coming to China reminds me of the importance of travel, how important it is to get out of your usual surroundings and question your culture from a different point of view. Every now and again I have to pinch myself to remind myself that I have not walked out into a film set and it is in fact real life. So why do I think that the future belongs to Asia? Well labour is so cheap, they are pretty developed in lots of things and they just want to get on and do things. Compared to the West they still have a lot of latent potential and so I think their influence will increase in our lifetime. 25 degrees today and we are off to explore HangZhou. The place we are staying in is very nice and 3 pounds fifty a night. Bargain. Well today I have a new niece, last night 3.06am to be exact there is one more Lawson in the world, just how is it going to cope (the world that is). She was delivered in the fantastic new maternity unit at Ulster Hospital. Anyone wondering if the 1% art policy that the health service has to fill its new builds should take a look at what they have done there. It makes for a totally different environment. Something fit for the 21 century. So what do I hope for my new niece? well I hope that by the time she is 18 Northern Ireland will have started to reach some of it's early promise. I hope that although she maybe brought up here and travel that she will not feel the need to move to a different country to fulfil any potential she has. I hope by the time she goes to school the Assembly will have sorted out the education issues and by the time she wants to work that something will have been done to narrow or abolish the pay gap between men and women. Then again what ever she wants to do in the future be it a full time mum or employee or perhaps start her own business or become a brick layer. I wish that there will not be too many obstacles in her way. How is all of this going to happen?? Well I suppose we need a bit of clear thinking by our politicians for a start. We need a change of attitude within the general population towards what girls and women are supposed to be doing and we all need to do our bit in encouraging people to think outside the box and support the next generation to live a more generous life. I know I will be doing the best I can, what about you?? Those of you that have been asking me we did get our Visa's for China, yes we did after a mad dash to Dublin they look really amazing. We are going very early tomorrow morning Belfast, London, Dubai, Shanghai. For a while it all seemed very far away but now its very close. There are 8 of us going. I know its going to be an adventure, slightly weirdly we went out for of a Chinese last night, as if we are not going to get enough over the next few weeks. I'm not sure how much I am going to be able to access my blog as some websites are blocked from China. However if I am able I will update it as we go. If any of you fancy a wee trip over the may bank hoiday I have prints in an exhibition in at Castle Coole details on www.basement-gallery.com the opening is on Thursday 2st May 6-9pm where there will be wine and Music exhibition Friday 2 to Sat 3 10-5 pm, admission to exhibition is free via the main doors of castle coole. I know some of you out there ask me when I actually do any work? the reality is up until the end of March I was working 12 hr days and now I'm taking the advantage of a bit of quiet before going to China new week to do nice interesting things. Today I went to see Iron Lady of Liberia with panel discussion afterwards. On at the QFT it was about the president of Liberia the first women Africian leader and her first year in office. I found it very interesting with a population of only 3 million people and heavily in debt, no running water or electricity what are the first things you do? The answer is she took control of the situation, gave power in her cabinet to other women, played China and the US off against each other and managed to get the countries debt wiped clean. She has tremendous inner personal power and worked selflessly to use it for getting stability in the country. The discussion afterwards from the panel was interesting, it consisted of Dawn Pervis, Jennifer McCann, Nuala O loan and Ines McCormick and the posse in the audience. What I was left thinking about was Northern Ireland is in transition, there are still not enough women in positions of power,what kind of impact is that having on society? The most depressing thing that I heard is that after 21 years of the Women's Opportunity Unit at Ulster University it is going to close. This is the last academic year for it to survive. When I ran the careers option for women programme many of my students went on to courses at the unit and used it as a way to access opportunities into a University education. It's a great pity that it is going to close...........once again Northern Ireland is in transition. Transition to what I wonder? Well I did my quick fire presentation on 10 mistakes that creative people make this morning in the Crowne Plaza New York, I mean Dundalk. Oh how Ireland has changed, I remember 12 years doing a cross border project with Dundalk and it was a nightmare journey in a minibus to get there and once you did you were not quite sure why you went. The multistory Crowne Plaza Hotel found at the end of the ring road is miles away from the Dundalk of 12 years ago. Great to see the celtic tiger zoom up to the border. Anyway I decided to try and make use of the hour I had with the creative participants and came up with 10 mistakes that creative people make. I'd be interested what people out there thought. 1. Having too many ideas. 2. Your ego getting in the way. 3. Not being able to sell. 4. Not understanding market forces. 5. Not being professional in your approach. 6. Not understanding that creativity is only one part of the building block required if you want to be successful. 7. Not be able to articulate the vision. 9. Not understanding the power of networking. 10.Not knowing when to break the rules. Of coarse each mistake had a bigger explanation to it but that's all part of the crack and I did manage to make them laugh a few times during it, which I always take as a plus. I'd be interested to know what you think? Two different aspects of Northern Ireland life I visited today, the first was a workshop on Venture capital. Lots of businesses looking to move forward with their business idea and get venture capitalists to back them into the next stage of development. The second was a film and discussion backed by healing through remembering around women in Chile who used their needle work skills to protest about what was happening while there was a dictatorship. Making wall hangings as a way to get the information out of the country on what was actually going on. A good discussion followed about memory and conflict and how is Northern Ireland going to progress it's healing and remembering. I came away from the discussion with a changed view, I had thought that in NI there was a window of opportunity to gather memories as people are aging and slowly if those memories are not captured they will be lost. However the panel was saying that in some countries its the grandchildren of the people who were involved in the conflict that are only now starting to find out more about how to heal it. I thought it was very interesting that here was a group of women who were using very gender specific skills as a form of protest. The church encouraged them and in many cases paid them a wage to support themselves when doing this and sold the produce in Canada and other areas that the church had influence. So it struck me that at both of these groups of people were important to NI. One group looking to the past and how to come to terms with it and the other working out ways to get finances to develop business ideas that will provide economic prosperity and move people forward and I could not help but wonder how many of one group were interested or aware of the other? So speaking of economic prosperity, what do you think about the announcement about finance jobs coming to NI from the South ? I would like to ask what finance jobs? The South says it has thousands of jobs it can't fill, the City of London announce possible 20,000 jobs at risk with the global credit crunch and NI announce possible jobs? Are they just trying to take advantage of lowerer salary levels? I have to admit I know people working in Finance who would love to move back to NI, but it will be interesting to keep an eye of this announcement . Will it actually pan out? Or was it just trying to gloss over announcements by Ulster weavers that they are moving manufacturiing to China plus other negative economic news. 10 years on and Paisleys going. There are natural ends to things, having just passed through 10 years of the good Friday agreement you do have to take stock. Consider what has changed what has stayed the same. While many things have stabilised, there is something I have noticed recently. Maybe it's to do with the eclectic mix of people I work with or am friends with. A lot of people have been having babies recently and as with each new life coming into Northern Ireland I was thinking about while these children will not be brought up within the context of the troubles they are still victims of it. Many of them live in segregated areas, they will go to different schools have different friends and have very little opportunity to mix with people from other religions and social classes. What kind of backdrop this will give to greater understanding I wonder? Is it just ignoring part of the issues there are? So what about the schooling issue? some grammar schools are holding out for special status. Having come through the system myself I had always thought that we had a great education system. It's the myth I grew up with and yet I didn't really stop to consider issues for those people who could not get access to it. Working in Belfast all these years has helped me realise the cost of the system to those in areas of deprivation. Many with multiple disadvantage what kind of opportunity is it giving them access to? Very little, do the people who want special status for grammar schools care? They don't really seem to, as long as their children get access to a good education they don't seem to care about what sort of society those children will grow up into and the impact a segregated schooling system has. So what has this got to do with Paisley retiring? when I went to collage over the the UK twenty years ago I remember being asked whats going to happen to N.I, is there ever going to be peace? At that time I said in my lifetime there will be a change, many of my N.I colleagues disagreed saying peoples views were too entrenched it was never going to shift. I'm glad to say I was right and Paisley going is another page turning. I just wish a few more pages would turn at the same time. The thing I love about being self employed is that if there is something you feel is important and you can fit it in around your other commitments you don't have to ask anyone else for permission you can go ahead and do it. Today was one of those days. A couple of years ago I was highlighted as delivering finance training in a examplar fashion and used as an example of best pratice by the Financial Serives Authority (FSA). Today I was being trained to be competent in delivering a presentation developed by the FSA ( Financial Services Authority ) to encourage people to be more proactive with their finances and take control of them. Base line research throughout the UK and N. Ireland showed that many in the population are not taking control of their finances and as a result this can have an adverse impact on their short and long term lifestyles. The FSA are rolling out a programme to help people take control one area which I think is great is they are developing a pack that midwifes will give to all mothers of new Born's helping them to figure out all the financial impacts of having a child. Current research showed that each child cost £180,000 to bring up and that's only until age 18. But some of the training was about the small things, comparing savings rates, credit card rates, what is a mortgage and how is it calculated, how do pensions work ? Child Tax credits. It was all very interesting. They are all things that I wish I had training on before embarking on my own financial Independence. I remember getting a cheque book along with my student grant and not knowing how to write a cheque. Struggling through working out what different kinds of mortgages meant, trying to understand how anyone could ever afford to set up a pension. You will be glad to know the FSA are also working on introducing financial capability at primary and secondary school level. I recently did some finance training and there were 2 recent graduates in the class, when looking at their personal budgets one of them worked out they were spending £5000 a year on take a ways -namely pizza's. Yet he was complaining he could not afford a car........................mmmmmmmmmmmmm I wonder why? Never mind what he was doing to his health. So I am now a FSA approved presenter on making the most of your money and will be delivering the presentation on a voluntary basis to employees. Why? because I like to see people taking charge of their lives and their finances is part of the mix, it gives me a warm fuzzy glow to help people out even in a small way. Check out www.moneymadeclear.fsa.gov.uk and don't get overwhelmed. When I say I'm going to China soon ( visa permitting) people say, why ? I say there is nothing quite like going to a country that you know very little about and none of the language to understand what it must feel like to non "Norn Ireland " people coming over here to Belfast. To walk around the streets and see nothing familiar, to listen to the accent ( and this really did happen to a friend of mine) and think she was taught the wrong language at school because she could not work out what people were saying. It was also on the 12th of July but thats another story. We do have a strange attitude to people from other cultures, in a recent development programme I was involved in there were 2 Russian women, they said that I was the first person in the 2 years since living in Belfast who had made a strong attempt at spelling and understanding their names. Pretty sad really, as a human being how would that make you feel? if no one made the effort with you ? Would you feel part of the society? So I'm soon of to China to have that feeling, that foreigner feeling. What do we do with creativity? What is creativity ? If you have it what do you do with it? is it all just ego? a sort of look at me I'm great kind of thing? Is it a gift or a curse? as a creative person I have to say at times I have thought of it as a gift and at times a curse. If you are creative you see the world differently you often don't except looking at things in a straight line and can bring a different dimension to what ever it is that you are doing. The problem is that in Northern Ireland although thinking differently about things is desperately needed it is often ridiculed, misunderstood dismissed as crazy. I came back to Northern Ireland with a first class degree, well travelled with an open mind and I found that in order to find a place in society here in Belfast I had to hide my creative talents. It is only when pretending to be less creative less, less open minded, less "different" that I started to get opportunities. Sad really when you think about it. It's what I think about when I come across yet another art student ever hopeful of hitting the "big time" what myth have you bought into? The myth that just because your talented the world owes you a living. That if you commit your life to your creativity somehow you will be fulfilled? That the world will recognise and reward you for this?
" if you expect to be rewarded for being talented you might as well be rewarded for having eyes in your head, it's if you have staying power that's what counts"
I decided 12 years ago to change direction with my creativity I got annoyed with making and designing "things" and changed to helping people, communities, organisations. It's been quite an amazing time. It's taken me from presenting to Neil Kinnock and Newt Gingrich. Shaking hands with Clinton, having tea in the Americian ambassadors residence in Dublin. Visiting the Dail, European Parliament, standing as a candidate in the Peace talks, working with Hundreds of really interesting people, all of which just want to do something with their lives and needed a bit of help figuring it out.It's been an honour to be involved in a small way. All of this I could not have done without being creative and questioning. During this time however when I visited an art museum my heart would sing "get back to this" get back to the core of your creativity. I would always draw while travelling keeping shetch books. Two years ago I decided to step in another direction and started a course at the Belfast Print Workshop http://www.belfastprintworkshop.org/ . Etching, what could be more timeless? I find that its an amazing process and have experienced a lot of joy and frustration working with it and when you go in you never know which one its going to be or if it's both on the same day. People who know me a a consulting capacity find it hard to understand my "art praticioners" side, people who know me in my art praticioners side have a problem understand my "consulting side". The common thread is both require creativity, patience, professionalism, extremely hard work and ultimately give other people some kind of different perspective. Next week I'm giving a talk at a two day creativity conference in Dundalk, lots of creative hopefuls buying into the myth. What am I to say to help them on their journey? 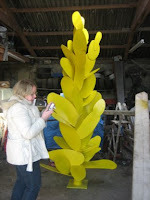 Which brings me to the large yellow sculpture at the top of the blog. 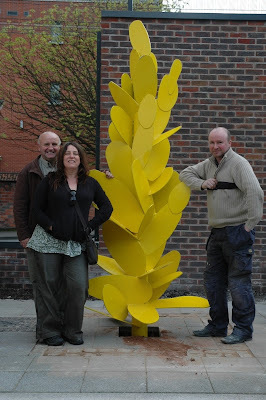 Tomorrow my two creative sisters based at Lisburn Art Centre, Red Apple Arts are putting in a sculpture at the new health centre on the Antrim road 6 oclock if anyone is around. It's based on a piece of gorse acting like a large yellow beacon of health in North Belfast and having worked in the area for 3 years I can tell you North Belfast needs all the help they can get. Do we need a museum of Conflict? The same goes for teaching contemporary NI History, there have been attempts to bring contemporary history into the curriculum but it's been pushed out, they don't want to deal with it. This leads to a vacuum there is no place that you can bring your children and explain all the different elements of the conflict in N.Ireland and get them to understand the complexity. Secondly people in Northern Ireland need a space that they feel comfortable going into that shows their history and if they don't want to see anybody else's point of view they maybe don't have to go into other areas of the museum that show that. But perhaps over time they might be comfortable in the space and curious enough to enter from another direction and see others people perspectives. Perhaps after feeling comfortable with that they will actually go and see some more single identity museums like Free Derry Museum or the Orange Orders Museum. We have no victors in this conflict so they cannot dominate the historical perspective, what we have are many different players all with a different agenda and a different story to tell. Thirdly there was a speaker from South Africa who spoke of how there was a generation growing up there that were calling themselves "born frees" that they were born free from apartheid and didn't want to know just wanted to get on with their lives and yet recent studies showed that within this group at collage there was a high degree of racism. As I went to pick up my nephew at the free gathering of "son of Billy Graham" at the Odyssey in Belfast who had gone out of curiously, there were hundreds of buses bringing young people from all over NI to hear him preach, they were part of Northern Ireland' s not quite born free but to use a good Norn Ireland term "bred and buttered" free. Free of bombing, free of internment, free of searching your bag before going into a shop, free of bombs, shootings, free of so many things and yet still constrained by the same influences that I grew up with 20 years before of Church, family history, location, schooling, friends, media, housing, opportunity or lack of it. The structures are still there and so the attitudes with prevail unless a museum starts to help question the mindset. Healing through remembering are involved in lots of different elements of this discussion they have supported 3 films on during the Belfast Film festival . Memory Truth and Transition a series of film screenings and discussions dealing with the past and the challenges of Transition. Today I was at a conference ran by Healing through Remembering http://www.healingthroughremembering.org/ they are a group of people that are working on a number of strands the one that I have been mostly been interested in the debate about having a Living Memorial Museum of the conflict in and about Northern Ireland. Around two years ago I went to a seminar calling for ideas for a living memorial museum. Just to see what was going on and felt compelled to send in a submission. My idea was to have a "I never realised" museum with five different "approaches". 1. North-The Northern entrance should show the historical perspective of the UK on the Irish " problem"
2. South-The Southern entrance should show the perspective of the South of Ireland on the "Northern Problem"
3. East-The Eastern entrance should show the Northern Protestant population. 4. West- the Western entrance should show the perspective of the Northern Catholic population. 5. Web based -the virtual part of the museum should show the perspective of the global eye on the "troubles". The idea being to encourage people to see the "Issues" in N.I/Ireland from different perspectives. The logic behind the idea was that in all the work I have done and experiences I have had in different areas of Northern Ireland, UK and US what has really struck me is that everyone is sure of that their perspective is right and not everyone is willing or acknowledges that people could have a different perspective or if they do, that it's valid. Maybe by creating a space with these perspectives and facilitating discussion it could move society on. There were lots of different elements fixed, movable, educational etc but what really struck me today that with all of what the speakers were saying was that how many of the themes were echoed in elements of the proposal I had put in. The first speaker talked about how Northern Ireland was on a curious cusp just on the edge of something else and in this period many things were possible. Some people were saying there was no need for such a museum. On my way back into the city centre I bumped into a women from one of my courses in North Belfast I ran about 8 years ago she was gainfully employed and was talking about she was talking to her daughter about how you used to have to get your bag searched when going into the city centre of Belfast, her daughter was appalled and started to say it would have been against your civil liberties and human rights etc etc etc. She is only in her early 20's living in Belfast yet this part of our historical memory and collective history was not know to her. This instance itself speaks to me of a need for such a place. Is it a load of bull? For those of you that have asked me yes the visa application for China has been delivered. One of the other people in our group that is going went down to Dublin yesterday and didn't get chased out of the Embassy so that's a good sign . So what all this Bull about? Well some of you may know that a couple of years ago I did an etching course at http://www.belfastprintworkshop.org.uk/ I just wanted to do something totally different that I didn't know anything about I had my eye on it for a year before I had the time to phone up one day and see about courses. What has happened is that I found out that I loved it. It's sometimes really frustrating, sometimes fantastic and always interesting anyway I ended up as a trustee of the workshop and a director of the Gallery. Other people have asked WHY, sometimes I have asked myself that but the workshop is a Charity a really great resource in the centre of Belfast and it needs voluntary people involved who want to keep it running. There are so many people in Northern Ireland who want things to change around them but will not put the time and energy into being part of that change and I for one don't want to be one of the wingers, there is always something you can do. What has this got to do with BULL's well Ivan Frew is having an exhibition there and the opening is tomorrow night 7 o'clock , he's called it animal farm ( not the video) and its inspired by being brought up in a farm. As well as having a wicked sense of humour he really knows his animals. Something that may interest you ( if you have a liking for social responsibility) is that the gallery is a social economy business so all of the profits go back into running it. If you have not been down to the gallery and workshop before it's in the cotton court building (opposite the Merchant) just press buzzer 8 you can also visit the workshop and see "where it all happens" but it's on the 3 floor and the lift is out at the moment so be prepared. As part of this blog is about Belfast in Transition I have to say its nice to see the Catherdral quarter that the printworkshop is located in has really started to take off. Even 2 years ago when I was go in down for my evening course it was the time that they were barricading the roads in the protestant areas.The city centre was a ghost town but now the Catherdral quarter is buzzing lots of people in the day and loads of energy in the place at night. There is always something going on and there is a real feeling of life in the place. Frank Ghery on the Shankill ? It's not every morning your getting your photo taken for a book? The International Fund for Ireland (IFI) are publishing a book of 21 years of the IFI's work I was interviewed a number of months ago for it and this morning we were getting photos taken at Townsend Enterprise Centre http://www.townsend.co.uk/ at the bottom of the Shankill and the Falls where I participated on a wider horizons programme. Why am I in the book you ask? well many years ago I came back to Northern Ireland after living in England the US and a time in Spain and I just could not settle there did'nt seem to be anything here I could do, everyone was down in the dumbs and depressed because of the ongoing political situation. The wider horizons programme took me and 24 other young people from the North and South of Ireland to Thunderbay http://www.thunderbay.ca/ in Canada for four months and it completely changed my view on what I could do with my life.Not only the creasefires happened. Out went the Art and in came the training/development/consultancy working on projects that would help in some why bring change to individuals that would in turn bring change to Northern Ireland. An NLP specialist told me I had a brain flip...................sounds good to me. In some why it's only now that I have had time to reflect on what an amazing 10 years I've had just on being helped to make that decision to stay and participate in working on change in some way. Anyway your wondering what's this got to do with Frank Ghery ? Maybe some of you are wondering who Frank Ghery is? well when I was down getting my photo taken I noticed a fantastic structure at the bottom of the Shankil and thought perhaps the great international architect himself had decided to build something on the Road. Or maybe someone just set fire to a building and the heat melted it but I think it looks great.